Mr. Hiruma (left) and Mr. Nagayama (right) at the entrance of Flapper were my companions. This green alley between concrete buildings is "Shiki-no-michi" and it leads us to Golden Gai. "Golden Gai" (Golden district) is an area in Shinjuku adjacent to Hanazono Shrine and renowned with its more than 200 small bars as the place where writers, poets, manga artists and directors, actors and staff of film and theater get together, drink and discuss overnight. Several years ago, a street scene of Golden Gai was used for the promotion poster of a new album of Utada Hikaru, one of the most popular pop-singers. Also Tawara Machi, a popular poet of traditional waka-style poems, was known to work here as hostess to study the real world through contact with bar guests. The accumulation of similar episodes enabled Golden Gai to revive its vitality in recent years. 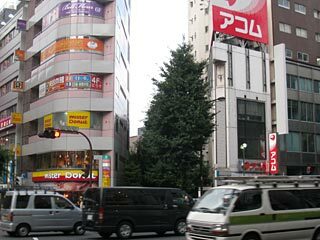 The origin of Golden Gai was a black market in front of the east entrance of Shinjuku railway station, which opened soon after the end of the WWII on August 15, 1945. The black market gradually turned into a district of outdoor bar stalls, but they were ordered to close by the Occupying Forces in 1949. The stalls then moved to the present Golden Gai area, which was then an empty lot overgrown with weeds and crossed by a street-car line. "Shiki-no-michi" (Four seasons alley), the walkway adjacent to Golden Gai, is the trace of railway. The stalls operating in another districts were also forced to move into the Golden Gai area and then the area grew up as an illegal brothel district - it was called "ao-sen" (blue line). - until prostitution became officially prohibited in Japan by a new legislation in 1958 (*). Different from European countries, prostitution is not allowed in Japan. The law passed through the parliament on May 24, 1956 and all brothels were abolished in 1958. Most of the wooden houses of Golden Gai were constructed during the initial period as three-story buildings. A unit for bar has only 10 to 15 square meter floor space and four units construct one building. Narrow alleys exist between such buildings and allow people convenient shortcuts between bars. After the introduction of prostitution-ban brothels changed their business into izakaya or bar and in the 1970s the whole area came to be called by a nick name "Golden Gai". However, contrary to the adjacent "Kabukicho", which by the time became the largest and most flourishing entertainment district in Japan, Golden Gai was left behind the development of the Japanese economic growth. Only some unorthodox intellectuals such as writes and poets knew the allure of secret tip Golden Gai. 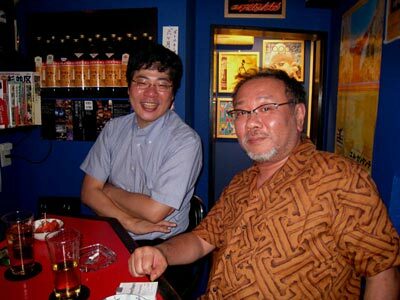 When Saki Ryuzo and Nakagami Kenji - both frequent visitors of Golden Gai - won prestigious literature prizes in 1976, Golden Gai suddenly stood under the spot light of the nation. Then, having a familiar bar in Golden Gai became a prerequisite for being a respected intellectual and Golden Gai experienced its golden age. However, in the midst of bubble economy and overheated real estate investment, Golden Gai became a target of city redevelopers from the mid 1980s and many tiny houses were bought up by them at enormous price. When the bubble economy suddenly collapsed, there left many deserted houses and closed shutters in Golden Gai and its liveliness was gone. It was after the beginning of new millennium, when some young people became interested in Golden Gai and opened bars with new concepts and ideas. 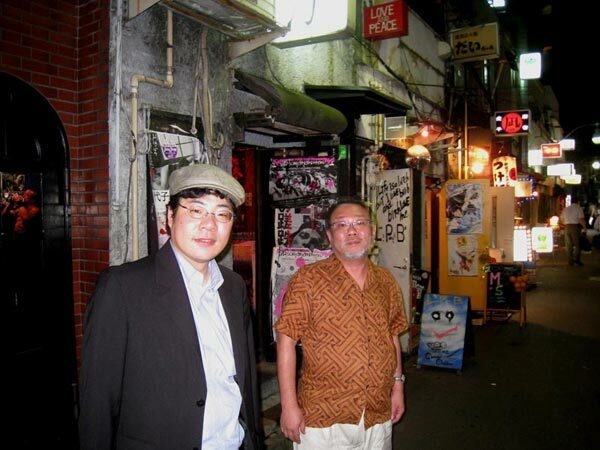 Some old guests of Golden Gai also became owners of their own bars in Golden Gai. Young people emerged also as a new generation of Golden Gai guests. I hear that the tiny wooden houses of Golden Gai do not meet the modern security requirements and once they are pulled down, no similar buildings will be allowed to be built. Therefore, once the present buildings are damaged, for example by fire or so, Golden Gai itself will be lost forever. Therefore, Golden Gai fans and supporters pay nowadays much attention to the preservation of old houses and try to preserve the special atmosphere of the post WWII entertainment district, and they are by now quite successful. I am one of those who are fond of the vulgar atmosphere of Shinjuku Golden Gai, though I am neither regular nor even frequent visitor of any of the numerous bars. This time my drinking companions Mr. Hiruma, writer on various social topics in particular on manga, and Mr. Nagayama (blog = Japanese only), publisher and critic on manga, guided me to Flapper. Flapper is a bar where guests can listen to various types of music such as R&B, jazz, rock, Japanese folk song and rock and Japanese old timer pop songs. There are only eight chairs at a counter on the ground floor and a wooden floored space upstairs for a group of several people. 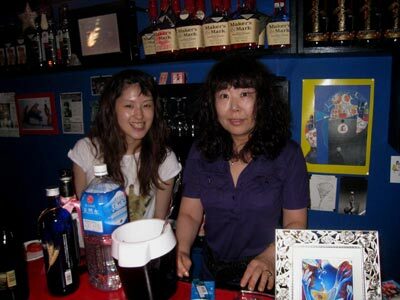 Mama-san (chief hostess) and a part time hostess - she works at a publisher during the day time - talk on various topics with guests sitting at the counter. The relaxing and intimate atmosphere of Flapper attracts especially the people from media. Different from some bars in the neighborhood which can boast their long tradition and famous clients, Flapper is easily accessible for everybody. How about trying it?